Kianga Mwamba, the daughter of a police officer, was driving home late at night in Baltimore in March 2014, when she saw police beating a handcuffed man. While stopped at a red light, she began to record the scene out her window. Mwamba spent the night in jail, charged with assault and resisting arrest. The video, she knew, would prove her innocence. But when she was released on bail and given back her belongings, the video was gone. Mwamba was devastated, knowing that her case now rested on her word against those of the police officers. But later, Mwamba’s teenage daughter pointed out that her smartphone automatically backed up photos and videos. And though the video of her arrest had been removed from her gallery, it was saved to her google account. Mwamba’s attorneys took the video to internal affairs and the Maryland State Attorney’s Office opened an investigation. Six months later, the charges against Mwamba were dropped, but nothing had come of the investigation. In December, she filed a lawsuit against the Baltimore Police, the mayor and city council, and four officers for assault, illegal arrest, and illegal imprisonment. Mwamba’s attorneys released the video on YouTube, resulting in local media attention. 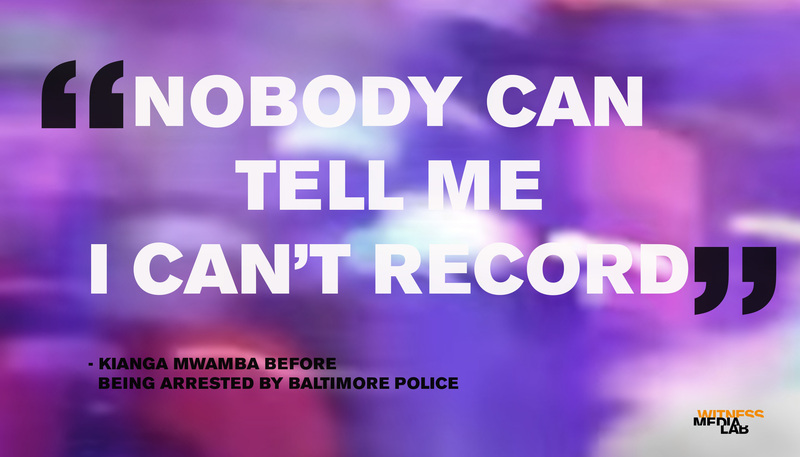 The Baltimore Police Commissioner responded with a statement that “the video does not capture enough information to draw definitive conclusions about what transpired before, during and after the arrest.” However, it stated, “the language used is unacceptable and will not be tolerated.” The police department has neither confirmed nor denied Mwamba’s charge that officers deleted the footage, and because the case remains under investigation, officials would not discuss what, if any, disciplinary action has been taken against the officers involved. Update: In December 2015, Mwamba settled a civil suit against the Baltimore Police Department. The city will pay Mwamba $60,000. Read more here. How does this case inform guidance and approaches to using video effectively for justice? Read the Media Lab’s Overview & Analysis. examining the impact of video in documenting police misconduct in the U.S. and its role in achieving justice and accountability.